SINGAPORE — When South Korea's president shuttled between North Korea and the United States to broker their first-ever summit, he faced both praise and criticism over whether he was a peace-making mediator or was helping North Korea find ways to weaken U.S.-led economic sanctions. A day after President Donald Trump and North Korean leader Kim Jong Un held their summit in Singapore, is it clearer whether Moon Jae-in played a positive or negative role? A quick answer: Probably not. Assessments of Moon's diplomacy have become more divisive and complex, with Trump criticized in both South Korea and the U.S. for the concessions he made to North Korea, while others believe the summit will successfully prolong the current mood of detente. Meeting for about five hours, Trump and Kim exchanged an historic handshake, took a short stroll together, patted each other's backs and signed a summit agreement. Trump promised to provide security guarantees to the North and suspend joint military drills with the South as long as negotiations with the North continue in "good faith." Kim, in return, agreed to work toward a vague "complete denuclearization of the Korean Peninsula." Those moves were unthinkable even several months ago, when the two unpredictable leaders threatened to nuke each other and traded a series of harsh personal insults. Moon issued a statement after the summit calling it a "huge step forward" toward peace that "helped break down the last remaining Cold War legacy on Earth." He acknowledged that many difficulties are likely to lie ahead but vowed to work together with the U.S., North Korea and others to bring lasting peace to the Korean Peninsula. "We will never go back to the past again and never give up on this bold journey. History is a record of people who take action and rise to a challenge," he said. 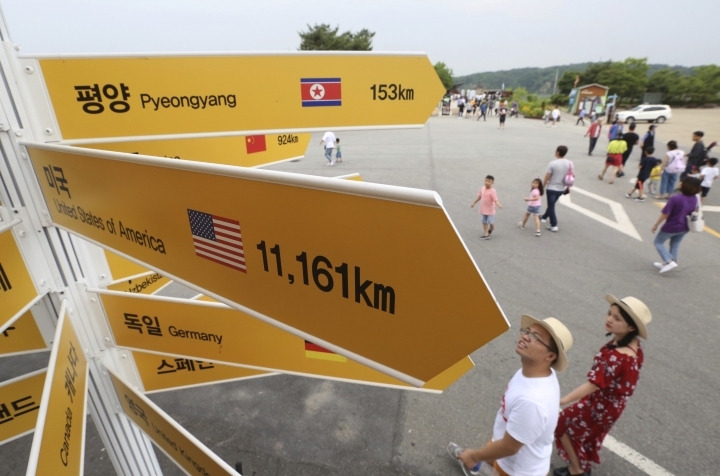 But conservatives in South Korea slammed the summit, saying it failed to curb North Korea's nuclear ambitions. They said both Trump and Moon should be blamed for not specifying steps and deadlines for North Korea's nuclear disarmament, allowing it time to perfect its weapons program. 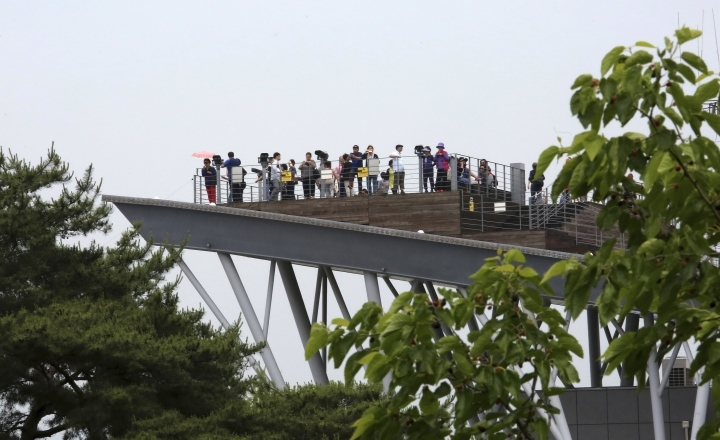 "High expectations were met by low results," said Nam Sung-wook, a North Korea expert at Seoul's Korea University. "Moon, and then Trump, were quick to bite on North Korea's invitation for talks. When Trump realized there wasn't going to be anything substantial in return, it was impossible for him to back out because he had already gone too far." U.S. officials had worked hard to get North Korea to agree to "complete, verifiable and irreversible" disarmament, and said they would not offer any major concessions until it took meaningful steps. Despite those efforts, Trump announced after the summit that he had agreed to suspend U.S. military drills with South Korea, something North Korea has long demanded. On Wednesday, North Korean state media said Trump had also agreed to the North's desire for a step-by-step disarmament process with corresponding U.S. concessions at each step, rather than immediate disarmament as the U.S. had initially sought. Trump's agreement to suspend the military drills apparently came without prior consultation with South Korea, baffling many who believe the U.S.-South Korea alliance, forged in blood during the 1950-53 Korean War, should remain strong throughout the push for a negotiated end to the nuclear tensions. "Why did South Korea and the U.S. form an alliance and stage military drills before the nuclear crisis flared? It's because North Korea has been belligerent," said Kim Taewoo, former president of the Korea Institute for National Unification in Seoul. He said cancellation of the drills "is really a bad idea ... and (Trump) betrayed our people." Asked to respond to Trump's decision, Moon spokesman Kim Eui-kyeom said the allies must consider a "variety of ways to further facilitate dialogue" during the nuclear negotiations. He said South Korea is still trying to figure out the exact meaning and intent of Trump's comments. Since taking office in May last year, Moon, a son of North Korean refugees, has sought to take the lead in diplomatic efforts to end the North Korean nuclear standoff, which had been dominated by world powers including the U.S. and China. Provocative nuclear and missile tests by North Korea last year initially gave Moon little diplomatic room to maneuver. But he kept trying to reach out to North Korea, and eventually found a role as a mediator after Kim offered in January to send a delegation to the South Korean Winter Olympics. After successful cooperation at the Olympics, Moon sent special envoys to North Korea who later traveled to Washington with Kim's proposal for a summit with Trump. Moon held talks with Kim in April at which Kim agreed to work toward "complete denuclearization." He met Kim again in May when Trump said he was withdrawing from the planned summit with Kim — a decision Trump quickly reversed. 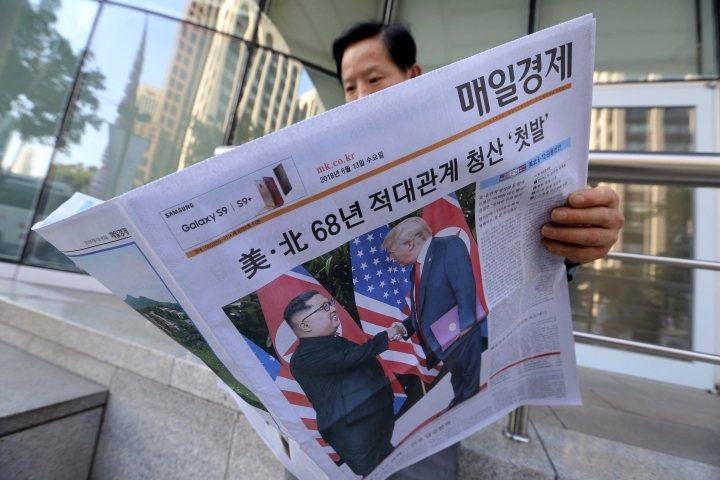 Experts now expect a temporary peace to continue since North Korea has probably won what it wanted from Tuesday's summit and Trump is unlikely to back down from summit deals that he wants to portray as a diplomatic triumph. 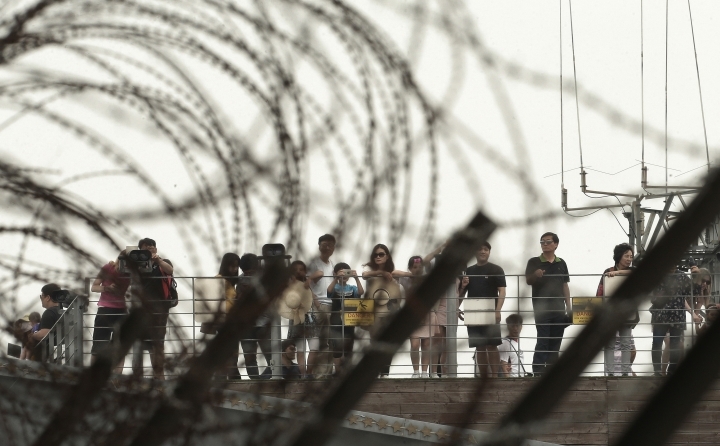 Analyst Hong Min at Seoul's Korea Institute for National Unification said critics of the joint statement signed by Trump and Kim are missing a bigger point. He said it's meaningful in itself that the leaders of the United States and North Korea met, talked and signed an agreement that will carry more weight and significance than any pact previously made between the wartime foes. The agreement's aspirational language on denuclearization was a "strategic decision" to reduce pressure on both sides and keep the process going, Hong said. Trump and Kim agreed that their countries will quickly engage in follow-up talks led by U.S. Secretary of State Mike Pompeo and a "relevant high-level" North Korean official. Bong Youngshik, a professor at Seoul's Yonsei University, said it's too early to predict how Trump's cancellation of the military drills will play out in future nuclear negotiations. He said North Korea is likely to consider Trump's decision a temporary measure while it remains in negotiations with Washington. 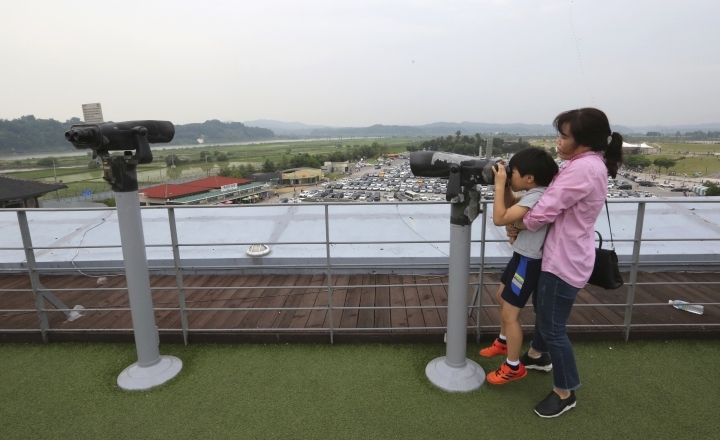 Moon may not face any immediate serious political repercussions at home since North Korea will likely take gradual steps toward disarmament to prevent others from thinking it reneged on its pledge. But if Trump seeks re-election in 2020, his government is likely to apply more pressure on North Korea to make substantial progress in denuclearization, which could bring the nuclear issue to another critical point, said Shin Beomchul of Seoul's Asan Institute for Policy Studies.